All you ever wanted to know about disk space, network bandwidth, CPU and IOs consumed when sending and receiving emails with attached files. 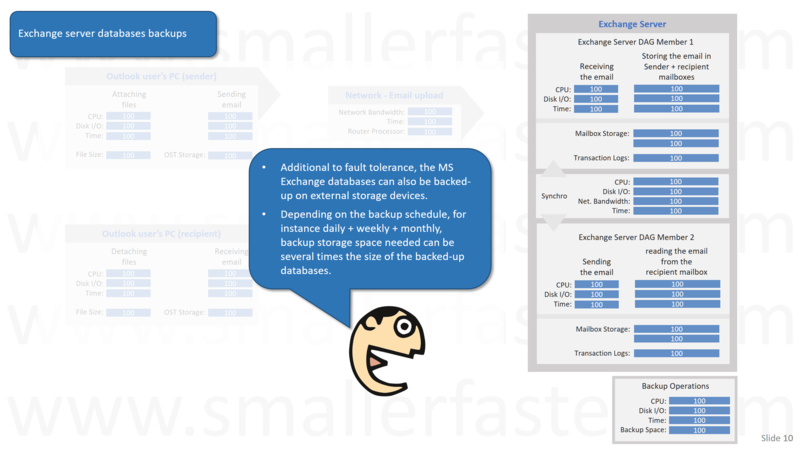 Surprised about how fast your MS Exchange needs for disk space grows in time? 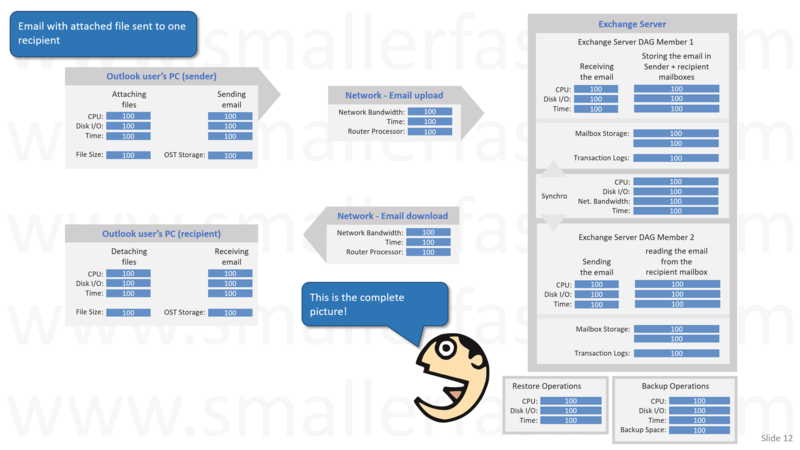 Would like to understand why all is so slow since you migrated your Exchange servers to the Cloud? 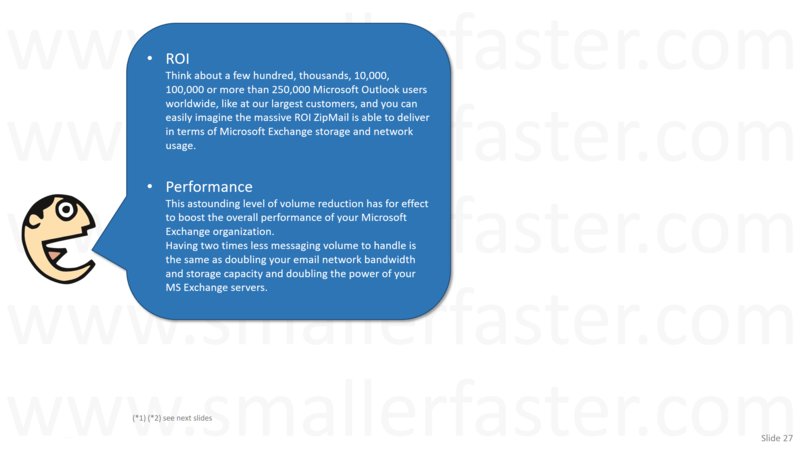 Looking for a simple solution to solve MS Exchange volume and performance issues? This presentation and the next steps suggested at the end can help! Switch your browser to full screen to display this presentation at best. Then use the orange buttons at the top of the green headers to scroll slides. A Microsoft Outlook user attaches some files to an email. 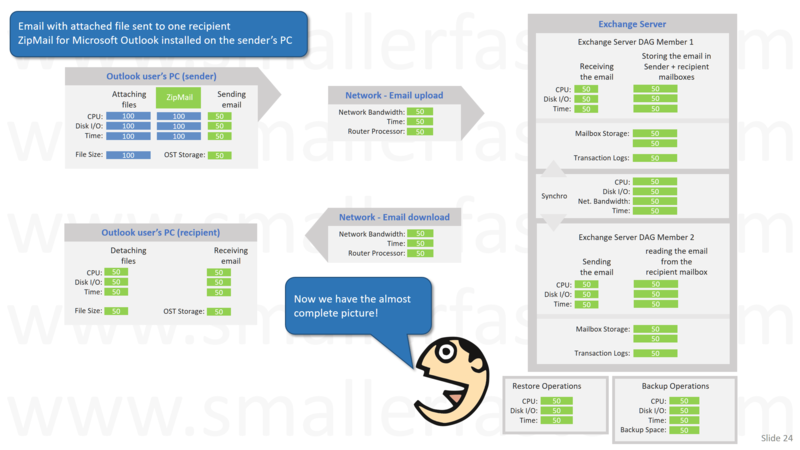 The email transits on the network up to the MS Exchange server. The email arrives on the MS Exchange server. The email is processed by the MS Exchange server. The email transits on the network to the recipient’s PC. The email arrives on the recipient’s PC. It is stored into the user’s OST file. The user views or detaches the attached files. 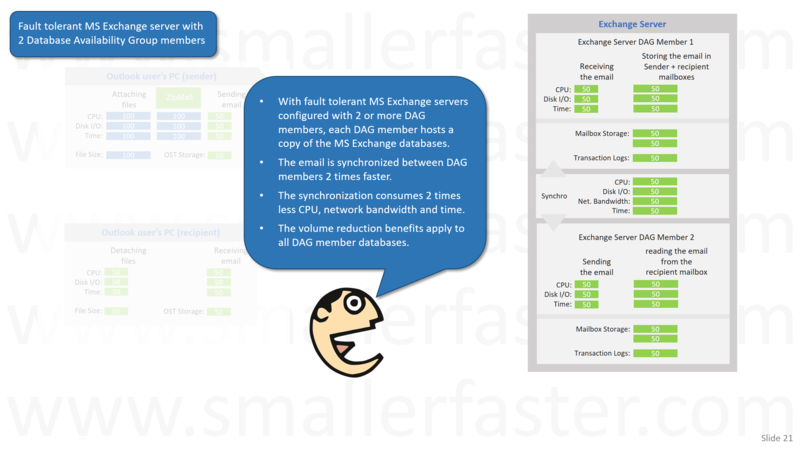 Fault tolerant MS Exchange server with 2 Database Availability Group members (DAG). 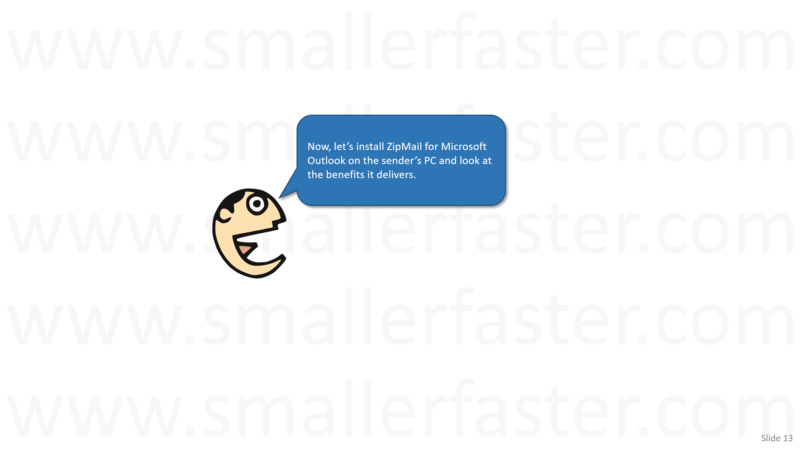 Now, let’s install ZipMail for Microsoft Outlook on the sender’s PC and look at the benefits it delivers. 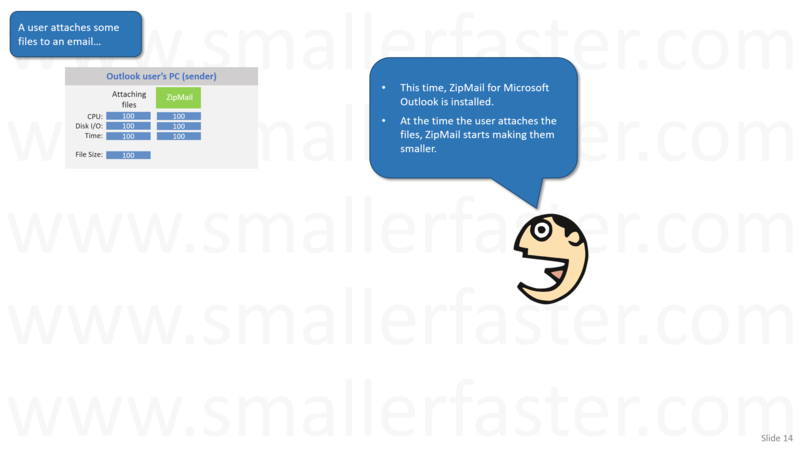 A Microsoft Outlook user attaches some files to an email. This time ZipMail is installed. The user sends the email and the ZipMail-optimized attached files to one recipient. 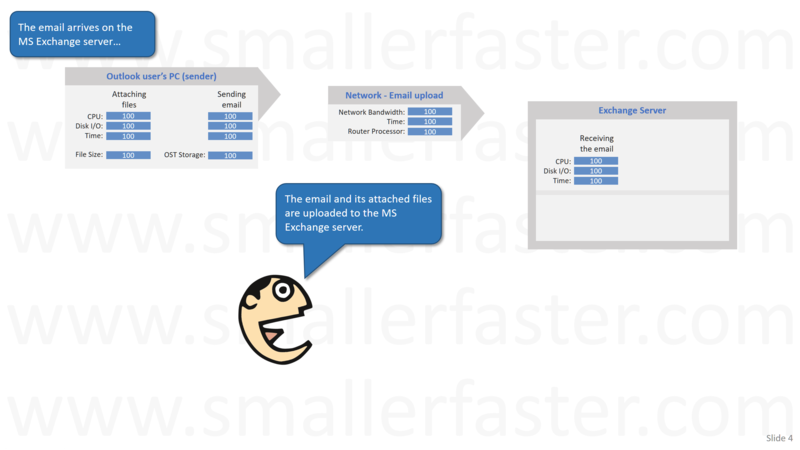 The email transits on the network up to the MS Exchange server. Its attached files have been optimized by ZipMail on the sender side. The email (its attached files have been optimized by ZipMail on the sender side) arrives and is processed on the MS Exchange server. 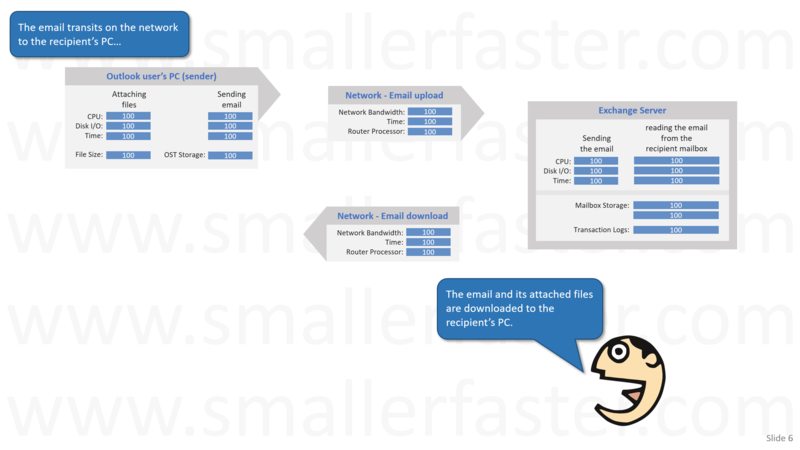 The email (and its attached files optimized by ZipMail on the sender side) transits on the network to the recipient’s PC. The email arrives on the recipient’s PC (its attached files have been optimized by ZipMail on the sender side). It is stored into the user’s OST file. The user views or detaches the attached files (optimized by ZipMail on the sender's side). 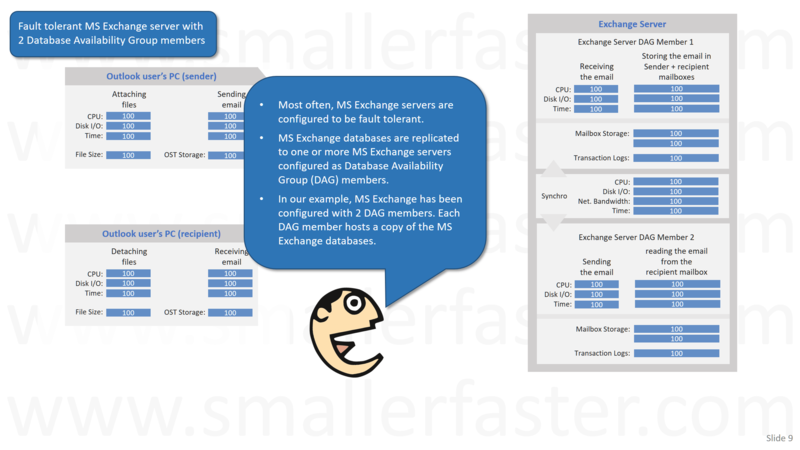 Fault tolerant MS Exchange server with 2 Database Availability Group members (with ZipMail). 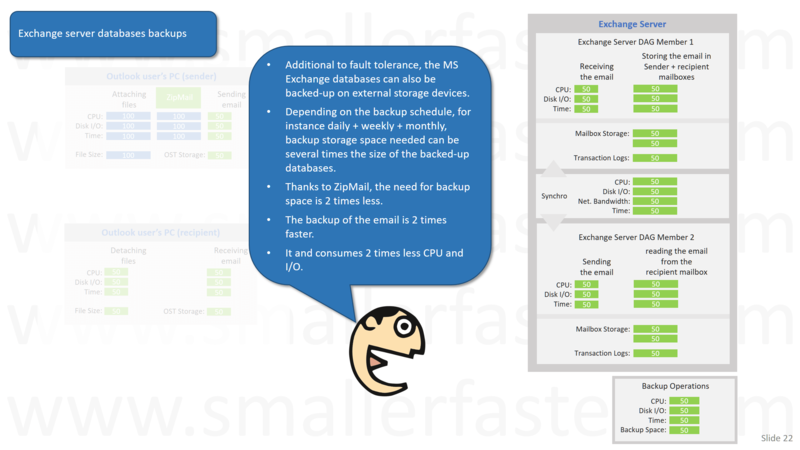 Exchange server databases backups (with ZipMail). 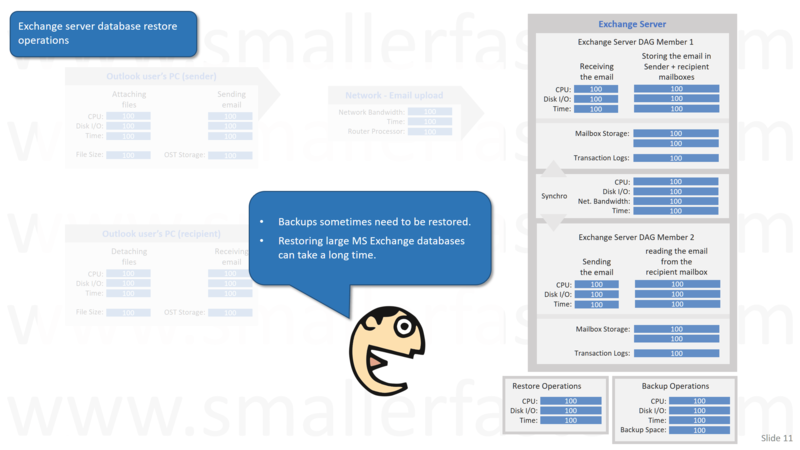 Exchange server database restore operations (with ZipMail). The previous slides were about an email sent to one single recipient. What about an email sent to 10 recipients? 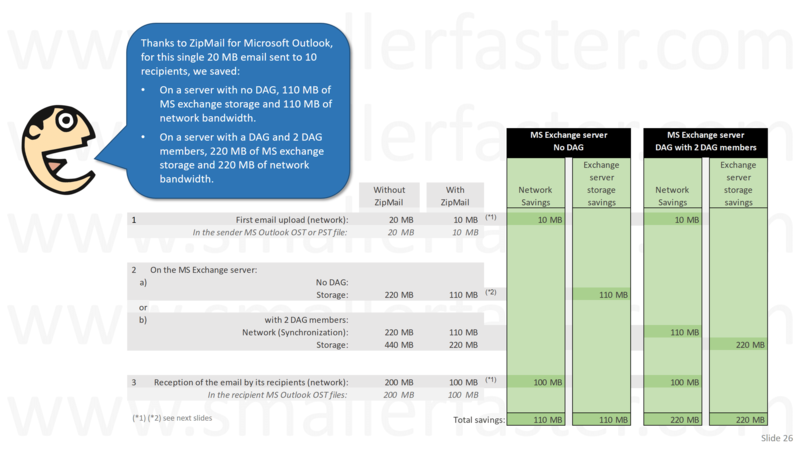 Between 110 MB to 220 MB of MS Exchange storage and network bandwidth saved by ZipMail on this single email! 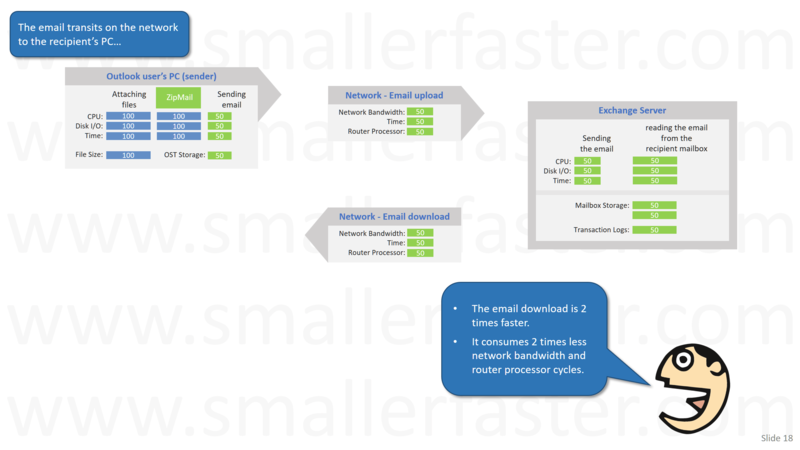 ZipMail vs. network compression and disk compression. Thanks very much for your attention. We hope you enjoyed this presentation. To know more about ZipMail for Microsoft Outlook please see the home page of ZipMail for Microsoft Outlook including videos of the ZipMail optimization features, samples of MS Office and Picture files (before and after ZipMail optimization), download of a ZipMail for MS Outlook fully functional evaluation version, a detailed list of ZipMail for Microsoft Outlook features and more interesting items. 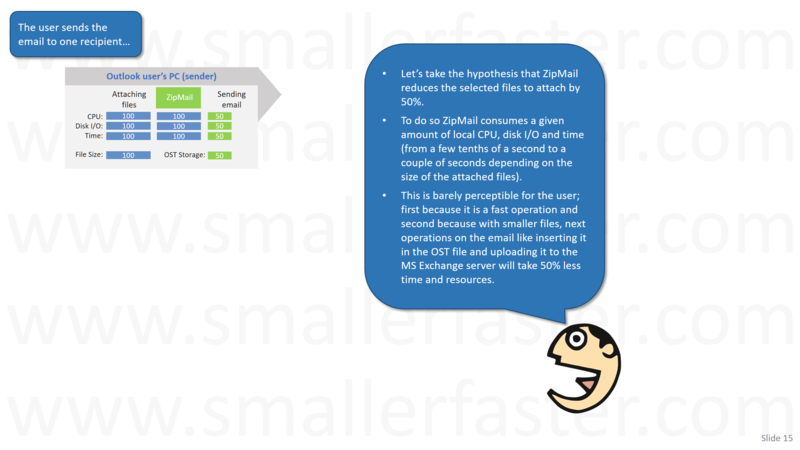 We also have a server version of ZipMail for Microsoft Exchange named ZipMail Real-Time. 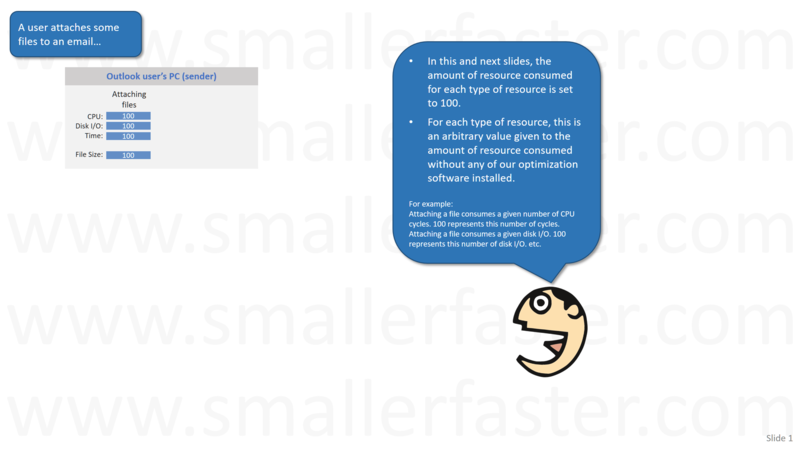 In case you use Microsoft OWA, the above presentation applies as well for OWA. And we have an optimization solution for OWA attached files named Z-OptimiZr for Web Browsers (formerly ZipMail for OWA). Make sure to contact us at any time, we'll be most pleased to answer any questions you may have about ZipMail for Microsoft Outlook.